I registered Zestee in The Netherlands in January 2012, and just submitted my sixth BTW quarterly tax return as an entrepreneur/ZZP. 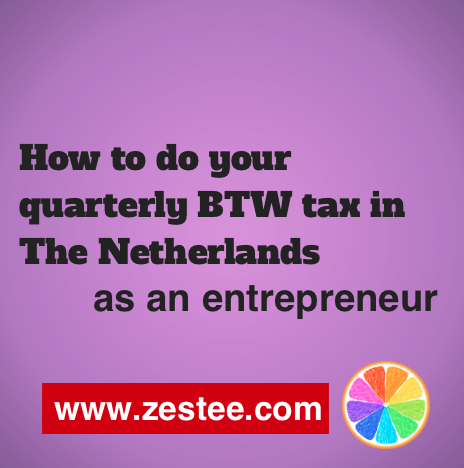 I’m taking some time to write a blog post about how to do your BTW quarterly tax return in The Netherlands for english speaking entrepreneurs new to business – as I wish that I had this guide when I started out! As far as I know, there is only limited information in english out there for entrepreneurs in The Netherlands. If you have some links or resources you use when dealing with accounts and tax as an english-speaking entrepreneur in the Netherlands, please share in a comment below. Disclaimer – I am NOT an accountant. I am a social media trainer who works on the philosophy of sharing information and advice to help others. This is a totally simple version of a return and as your tax is your legal responsibility, I highly recommend you make sure you refer to the correct information via the Belastingdienst. However what I’m attempting to do is document for myself and others how to save yourself some time and stress every three months to fill in some of the “gaps” that the tax department may not explain in detail to english speaking entrepreneurs. The screen below will appear. I’m afraid I can’t remember exactly how I got my users name and password! 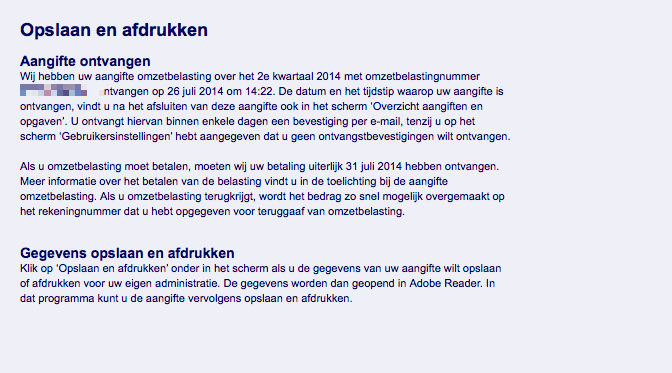 I think when I registered with the KVK/ Belastingdienst when I first began, I was posted information about this. Next you’ll be taken to this screen below, which shows any returns you have submitted in the past. Any outstanding ones should be clickable, as the red arrow shows below. Step 3: Introduction and do you have something to declare? Once you click on this, you’ll be taken step by step through the return. The section you are currently viewing is highlighted in pink on the left hand side. 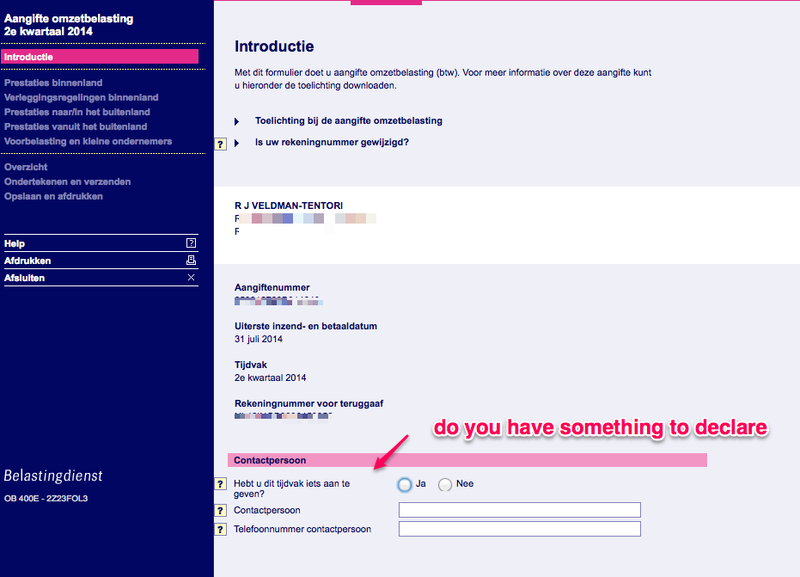 First, is the introduction, as below, with an overview of your details and asking “Hebt u dit tijdvak iets aan te geven”? Do you have something to declare. Answer “ja” (yes) or “nee” (no) and then complete your name and phone number. Scroll down and hit “akkord”. 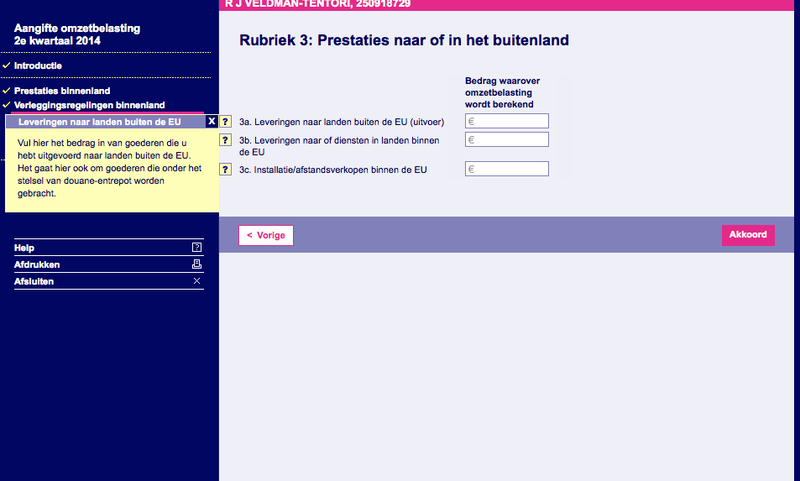 As far as I understand, “Rubriek 1” deals with the invoices you have issued within The Netherlands. 1a: Services & products with the high BTW tariff – this is the 21%. 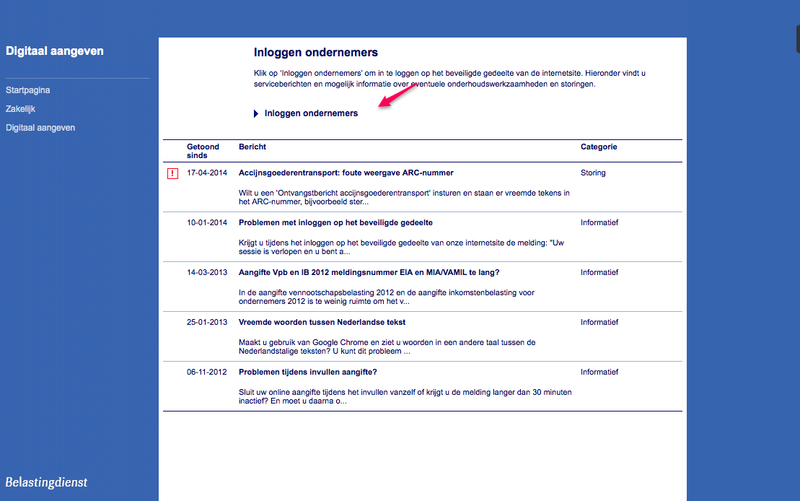 So the “bedrag waarover omzetbelasting wordt berekend” is the grand total amount of my invoices for the three months being considered, INCLUDING EXCLUDING the BTW (**see note at end of post) – in this case April 1 – June 30. 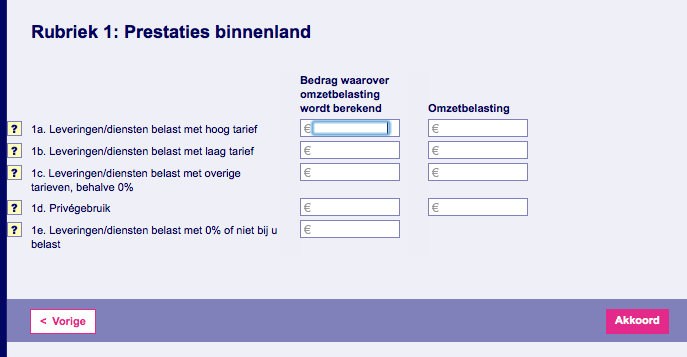 The column on the right next to it – omzetbelasting – is the total amount of BTW you have invoiced for that quarter. A mistake I made in my first return was that I only totalled the invoices that had been PAID in that quarter and not the ones that I had sent and were unpaid. I found out later that this is incorrect, you have to pay the BTW tax on any invoices – outstanding and paid – that you issued that quarter. If that client didn’t pay in the end, you can claim it back later. Also handy to know is don’t include cents – just the whole euro amount (basically just ignore anything in cents, you don’t have to round up or down). 1b is services and products with a low tax – I think this is the 6% tax relevant to some services and products. Again, if this is you, I guess you’ll know it! I just leave it blank. 1d Private use – if you need to allow for private use for products and services, but as I have separate accounts for private and business, again I leave it blank. I did wonder at first if this was relevant to me at first – Prestaties translates to Performance and I thought perhaps as I deliver social media training worldwide online I may have to tax differently and account for it in this section. However based on professional advice I’ve had from the belastindienst and an accountant for my situation this is not relevant to me, so I leave both sections 3 & 4 blank or enter “0”. Step 7: “Prepaid tax”, small entrepreneurs rule and estimate. you cannot claim any tax on services you have obtained from outside of NL (for example, my web hosting in america that I pay in USD). Complete your name and details and click “akkord”. Step 10: Sit back and relax! Pour yourself a cup of tea or a beer, it’s all done for another three months! Do you do your own BTW returns? I’d love any feedback on this post and your experiences with accounts or tax in the Netherlands in a comment below. March 2015: Important update: see above Step 4. ** For nearly 2 years, I was doing a quarterly BTW return thinking that “omzet” (turnover) was the entire amount, including BTW. Despite the fact I had showed these returns to an accountant, submitted them to the belastingdienst for 2 years and also attended several training sessions and asked a lot of questions, somehow this was overlooked by everyone! Tax is complicated enough when it’s in your own language, let alone another, so thanks for helping out Ruben & Roy in comments! Any other comments on this topic most welcome! Thank you for sharing this post… I am making my very first tax return declaration in the Netherlands and was a bit confuse where to start, and this post helped a lot to “break the ice”! Very good you took the time to put this down! Just one remark: correct the link you provided by Mijn Belastingdienst, it is: https://mijn.belastingdienst.nl/ppa/ (the one you have is not working). I’m sorry, but this is incorrect! Translated the sentence means “amount upon which value added tax (VAT/btw) is calculated”. So you put your quarterly sales EXCLUDING btw in the left column and then the btw in the right. When you put out a dutch invoice, it should show one part of the money which is yours (“netto” or “exclusief btw”) and the other part which is for btw. As of writing it’s 21% of the netto amount in NL. Sure, the customer has to pay you all, but only one part is actually yours. The other part you’re just holding on to temporarily until btw comes to claim it quarterly. If you think you have made wrong tax-returns over the past year you also have a couple of options to correct these problems. One way is to make up what they call a “suppletie-aangifte” which you make up once you have completed your annual-accounts and in there you supply the correct figures. 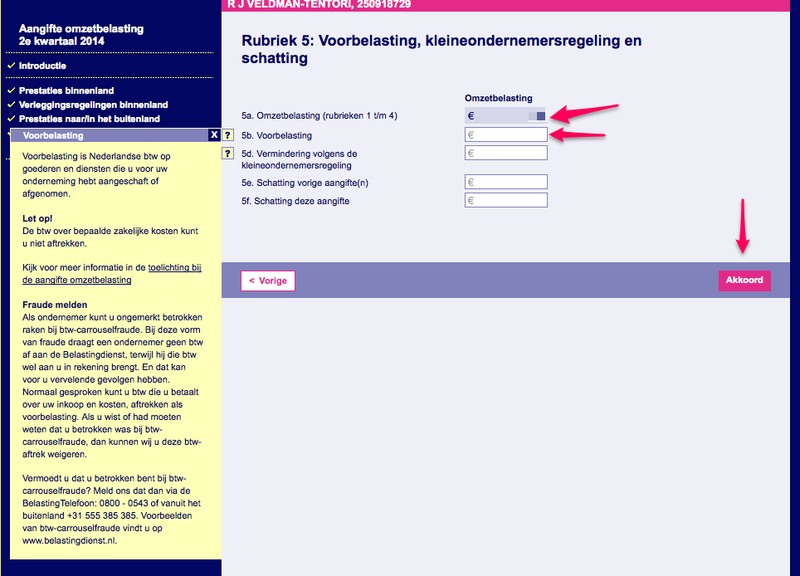 Another option is to inform the “belastinginspecteur” about your wrong returns by letter with the correct figures. But please, do check this out with your taxlawyer or accountant and keep account of the due-times involved in this. Hope this helps a little. Thanks Renee – this was really helpful as a new entrepreneur! Hi Renee, a QQ – regarding 5b: Voorbelasting – “prepaid tax”, so for example the printer you bought, let’s say the btw was €17 and you enter that as you know from the receipt, do you then need to post the receipt somewhere or just hold onto it in case someone needs evidence at some point? As far as I’m aware, you simply just keep it for your own records for a certain number of years. Many thanks for this, just seeing the website somewhere else made it less daunting!!! 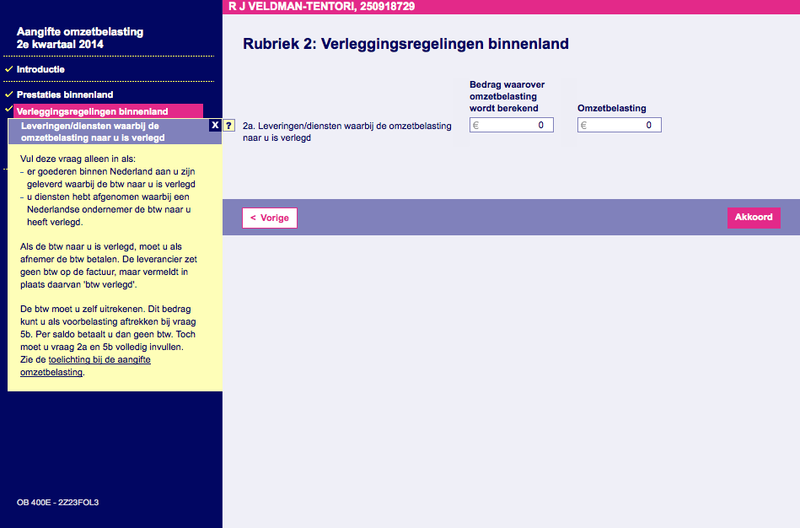 I am familiar with doing VAT returns for the UK but the Dutch system is quite complicated! So this is BTW (VAT) but when do you fill out generally the annual tax returns where you include your expenses outside of the Netherlands such as a supply from the UK or Italy? Hi very useful indeed, but do i submit also the real paid bills (VTA I claim back for). ANd if so how do i do that? In pdf? Hello , really nice post . I want to know if we have not issued any invoice or no earning in last quarter do we still need to file the BTW tax. We registered a kids club for music and dance class . We don’t know how much is btw for this . Hello, I am new to this system and I start my business from the first day of this year. But I tried several times to search for a page to fill in VAT return and I never found the page you presented in this topic. May I ask if it only shows after a quarter which means I can only find the page in April for the first quarter of the year or I miss something in the system? This was VERY helpful. Thank you for taking the time to share your hard-earned wisdom! Do you happen to know if you are able to print (step 9) past returns? I cannot for the life of me figure out how to access. Thank Renee… your piece of work is very much appreciated.. Good Job ! One question though. When do the outstanding returns become clickable (I’m referring to the first screenshot of Step 2 of your guide)? For the first time I’m trying to issue an empty declaration without relying on a 3rd party company, but the declaration I’m supposed to fill in before the end of September is not showing on the panel yet. Any idea? 🙂 Thanks! I’m not sure I’m sorry! Good luck. Hey! You mention about not needing a decimal point, and it mentions on the form you can either round up, or down to your advantage. Am I right in thinking that rounding up in the instance of expenses would be best? Then rounding down on your income would be best? So, if I have a figure that’s 12.75, I’d round it up to 13 if it was to do with expenses, and round it down to 12 if it was to do with income? Thanks! HI. Thanks for all the great information. I got stuck however on the final part where it asked my “function”. What is this exactly?